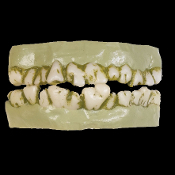 Prosthetic teeth fit most adults and teens ages 15 and up. Made of soft, safe material, they are flexible, comfortable to wear and can be used over and over. 1) Rinse off teeth with warm soapy water. 4) Teeth do not require adhesive. However, a commercial dental adhesive may be used. Make certain Monster Teeth and your own teeth are DRY. Apply adhesive to inside walls of Monster Teeth and insert into mouth. Monster Teeth adhere to your gums, not your teeth.